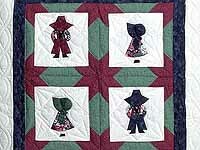 A delightful rendition of the charming Sunbonnet Sue design. 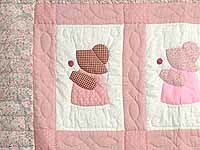 Lovely pink to salmon tone fabrics fabrics. 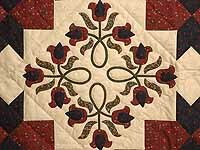 Note the gorgeous border fabric. Well made by Lancaster Amish woman. 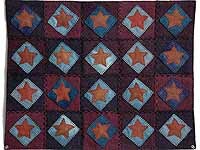 A lovely little quilt made with woolen fabric -- great color selections and very interesting stitching. Made here in Lancaster by an Amish woman. Includes tabs for a hanging rod. 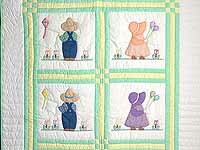 A delightful rendition of the charming Sunbonnet Sue and Sam design. Note the puffy bonnet and arms. Lovely bold fabrics. Well made by Lancaster Amish woman. Includes a sleeve for a hanging rod. 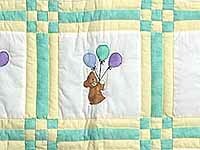 A delightful for quilt for that very special baby. Soft crayon-like coloring. 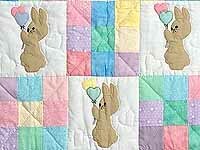 Lovely little applique bunnies! 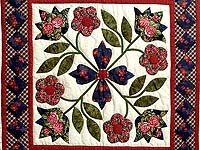 Made with love by Amish grandmother who has signed her name on the quilt back. Includes a sleeve for a hanging rod. 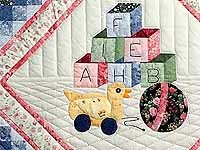 A delightful for quilt for that very special baby. Soft crayon-like coloring. Lovely little applique bears! 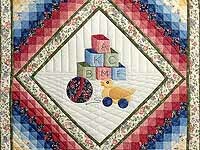 Made with love by Amish grandmother who has signed her name on the quilt back. Includes a sleeve for a hanging rod.